San Diego State’s Jalen McDaniels went this way, that way and all the way to the basket in a recent win over UNLV. McDaniels’ moves brought a big smile to one gentleman and had eight others taking notes. The first man was Steve Fisher and yeah the retired SDSU coach knows a thing or two about winning hoops. The eight guys scribbling into their notebooks know hoops, too, and that’s why these NBA scouts were salivating over McDaniels. The Aztecs’ season has been a roller-coaster ride and climb aboard at your own risk. This is a team which requires a seat belt, as in one Mountain West Conference game in which it looks great and wins. Then in the next one it can blow a 20-point first-half lead, as it did to Fresno State, and fall. But fans are head over heels after watching McDaniels and for good reason. He’s doing things last seen in these parts when future NBA star Kawhi Leonard was making jaws drop at SDSU. 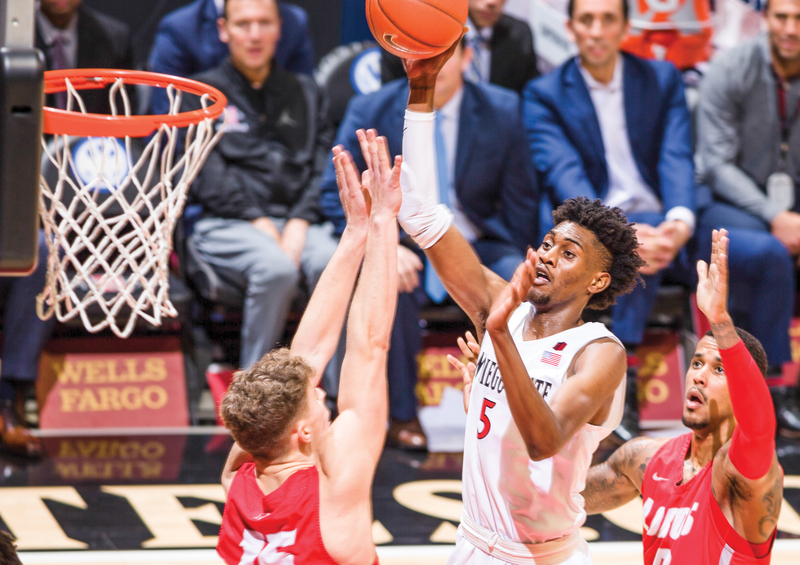 When McDaniels, a lengthy 6-foot-10, 195-pound sophomore forward, produced his fifth straight double-double on Saturday, he joined Leonard as the only Aztec to do it in the last 23 years. How special was McDaniels as the Aztecs beat the Rebels? No college player has scored a career-high 30 points, 13 rebounds, five steals and four assists in the same game since LSU’s Ben Simmons did so. Simmons went on to be the NBA draft’s first overall selection in 2016. We’re doubtful that McDaniels will go No. 1. But we’re confident he won’t last at SDSU much longer. He’s too good, which is a good reminder to go see him while you can. When McDaniels heard about matching Simmons, he reacted like spectators after watching his steady inside play, his solid mid-range jumper and him seemingly knowing where to go for rebounds before the ball exits the shooter’s hand. An astute observer of SDSU hoops could see this coming. McDaniels, as a redshirt freshman last year, revealed his rebounding skills in leading the team by averaging 7.5 per game. He showed his shooting touch by pacing SDSU in field-goal percentage (58.6 percent) and at the free-throw line (78.8) en route to being named All-Mountain West third team. He’ll receive that conference distinction again this season, but only by substituting first team instead of third. McDaniels’ game has made such strides that playing in the NBA is not a far-fetched scenario. “He was an NBA player today,” said UNLV coach Marvin Menzies, a former SDSU assistant, after McDaniels breakout outing against the Rebels. What’s nuts is to think that McDaniels, the only SDSU player to be selected the conference’s top player in consecutive weeks, will be around as a senior. His combination of skills and want-to will have him competing at the next level soon. Which makes SDSU’s rivals mindful of McDaniels, every time he steps on the court.